Can you Reheat French Toast? | Can You Reheat? I have always enjoyed making Sunday breakfast for my family, but now that my kids moved out, it is just my wife and me. Since we no longer have a few more mouths to feed, we want to start making Sunday easier by making some portions of French toast ahead of time. Can you reheat French toast? Reheating French toast is very easy to do and leads to results as good as eating them fresh. You can use the toaster, oven, skillet, or even the microwave. This meal is truly the champion as being reheated. On a baking sheet, spread out a sheet of aluminum foil and place your slices on the foil. Preheat your oven to 375 degrees F, and place the sheet on a rack once the oven has come to temperature. Allow the slices to warm through for about 8-10 minutes. To reheat French toast using the skillet, you will need a big enough pan to fit a slice of toast, or multiple, depending on how many you are looking to serve. Simply warm the pan and give it a quick spritz with non-stick cooking spray before adding your toast. It will only take a minute or so on each side to bring it back to crispy goodness. If you simply refrigerated your French toast, you can have really good leftovers; however, it may not be as crispy as other methods would yield. To combat the moisture that may keep your toast from being ideal, place a paper towel under it as you microwave it for 15-20 bursts. Do no overheat! Check each time the microwave goes off to ensure that is warming through nicely and is not getting soggy. 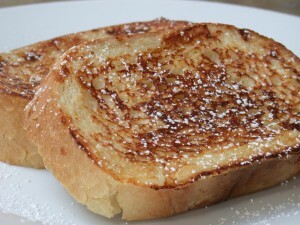 French toast is one of those foods where you can make it ahead of time and enjoy its deliciousness any time of the day. With these easy ways to reheat your leftovers, there is no reason you cannot have a wonderful Sunday morning brunch! Is there anyway you can include the recipe you used for the French toast? I find some recipes (more egg or less egg, more or less milk etc) makes a difference.